"My name is Good Boy, and I have a new leash on life! After spending seven years at the end of a tow chain in a junkyard, enduring isolation and starvation at the hands of my "owner", I am now free!!! When I arrived at my rescue mom's home, I couldn't believe my eyes. There to greet me were other four legged furry critters, some of which looked something like me! I ate my first meal in weeks and subsequently threw up everything for the first three days, including the dirt I ate during my last days in the junkyard. I had diarrhea for nine days but my rescue mom didn't care – she just hugged me, called me a good boy, and told me I was in a safe place. 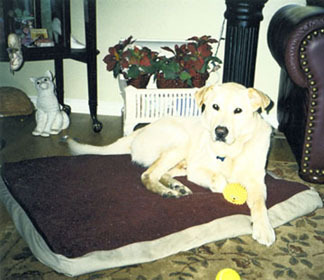 When I visited the veterinarian days after my rescue I weighed in at 58 pounds. 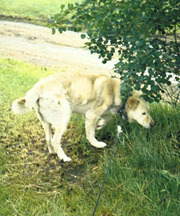 I'm a yellow lab and husky mix and should have weighed closer to 100 pounds. 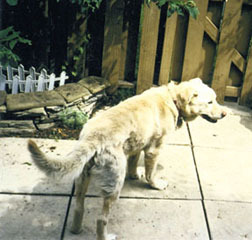 In the weeks that followed I learned so many things about what it means to be a loved dog. I was walked five times a day; I was fed six times a day; I learned how to climb stairs; I learned how to climb onto a big-dog bed; I learned how to play with a squeaky toy and make it squeak for 10 annoying minutes at a time. I learned that when I bark someone will actually listen. But most of all I learned that people weren't bad after all. My rescue mom had me neutered and vaccinated. Then she found me a new home in the country with a loving couple who were committed to helping me overcome my fears and show me unconditional love. During my first visit I ran down the country road without looking back – it was my first real taste of freedom. My good fortune knew no boundaries! I bonded with my new guardians immediately. And the following week I was delivered permanently into their loving arms to retire in peace." Unfortunately, this story doesn't have a happy ending. The years of deprivation and neglect took their toll on Good Boy and the demons that haunted him won out over the unconditional love that his rescue mom and new guardians showed him. It was decided that in order not to jeopordize anyone's safety, the kindest thing would be to euthenize him and allow him to find eternal peace at the Rainbow Bridge. I'm so happy though, that I was able to provide him with one month of sheer bliss that he otherwise would not have known.